William Wildermann Interview with Bruce Duffie . . . . . 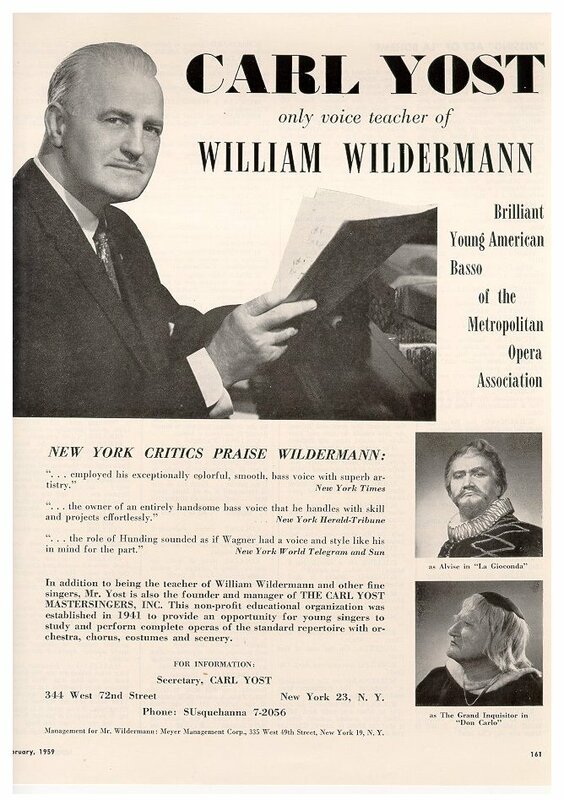 The German-born American bass William (Bill) Karl Wildermann had a life-long journey in the opera world. He grew up in the US, and was a longshoreman for a time before his professional singing career. Starting at Radio City Music Hall and touring with the San Carlo Opera, he was a stalwart at Lyric Opera of Chicago during its first seasons. Later he went to the Met and the New York City Opera, and was at the State Theatre in Stuttgart, Germany for many years. 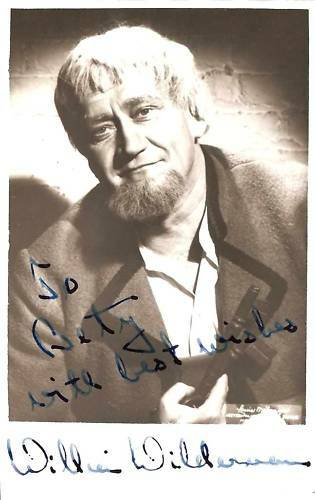 He was a World War II veteran and USO performer. 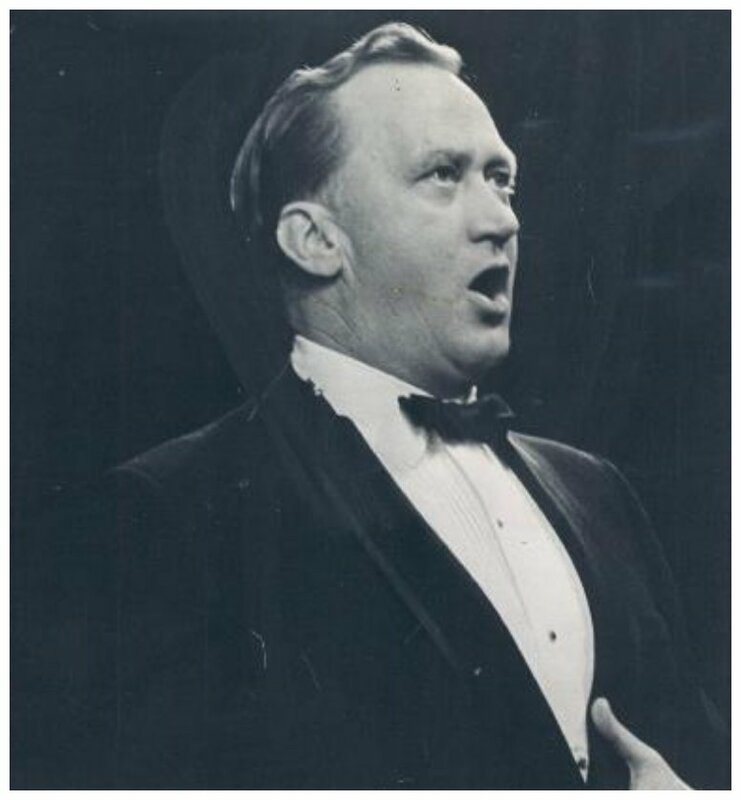 His operatic career included performances at Carnegie Hall and performing for the Queen of England at Convent Garden. He also gave performances in Israel, Argentina, the Washington Kennedy Center, Santa Fe Opera and the Pittsburgh Opera. As can be seen, Wildermann had been at Lyric Opera since its earliest days, playing small but important characters in many operas. 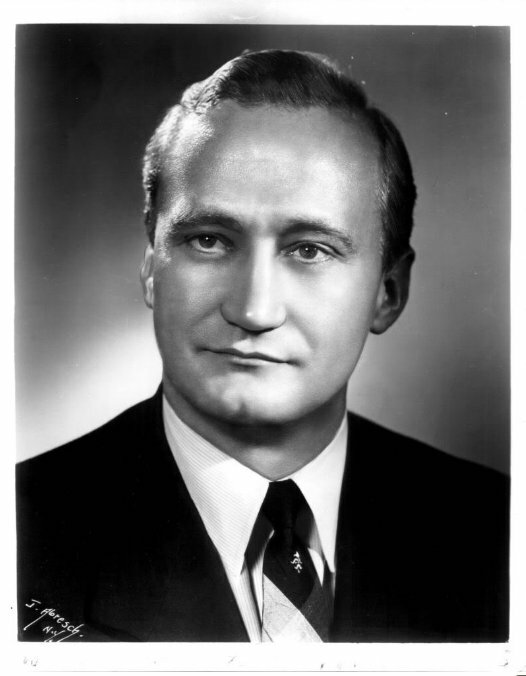 His final visit to Chicago in late 1986 was a new part, that of Dikoy in Katya Kavanova of Janáček, sung in English. Between those performances he graciously allowed me to meet with him at his apartment for an interview. Portions were heard on WNIB several times over the years, and part of the conversation was transcribed and published in Wagner News in December of 1989. This website presentation has been re-edited and is our entire chat. Bruce Duffie: How did you first get involved in singing? William Wildermann: I tried everything else and I didn’t like it. [Both laugh] I always liked to sing and I must have had a decent voice. I sang in a church choir and somebody said I should study. They knew a teacher, and I went and had a few voice lessons. At the time, I was a longshoreman on the docks of New York and New Jersey loading and unloading ships. That was what I was doing. After a year or so of voice studies with a private teacher, I said it was ridiculous. You need connections, and I was grimy and tired from work. The teacher said I had something that should not be neglected, so he said I could continue the lessons without paying a fee as long as I would just stay with it. He had a studio that was owned by one of the executives of the San Carlo Opera Company, which traveled all over the United States. BD: Didn’t Gallo run that? WW: Fortune Gallo, that’s right. He owned the house and knew my voice teacher. One day Gallo called and asked my teacher if he had a student who could jump in the next night as the King in Aïda right there in New York City. He wanted to do my teacher a favor, so I went down and auditioned, and I made my debut as the King the very next night! It was the only part I had ever learned! That one part I had worked on! This was around 1945, and I’ve been singing ever since. I had always admired the people up onstage. They were gods to me. I loved opera, I loved good music, but I never dreamt... So when they said they would love to take me along on tour but I didn’t have any repertoire, I said, [excitedly, like a little kid] “I’ll learn it, I’ll learn it!” [Laughs] So I learned role one after another, and went with him for three or four years in the provinces and everywhere. When I wasn’t singing I would be in the audience watching, learning, observing. That’s how it starts. So I just kind of fell into it. BD: Do you like being a bass? WW: It’s all I know so I better like it. I do like being a bass. Maybe I kinda envy the tenors once in awhile a while, but in Mozart the lower voices are treated very well. I’ve been offered baritone parts such as Pizarro, but I love Rocco. It’s my favorite part in the whole world and I’m very happy to sing the lower part. BD: Why is it that some basses have this latent desire to move higher? WW: It’s perhaps more interesting repertoire. Looking at the early days of Lyric Opera, Ettore Bastianini was a great baritone and yet he started out as a bass. Rigoletto and Di Luna and others are crackerjack parts. A bass doesn’t have that many options as far as repertoire goes. But I was made to be a bass and I’m very happy. WW: I just think he’s a very sweet and nice guy. He’s nice to his prisoners. He’ll give them extra rations if he can, and he loves his daughter. He has a strange little gold aria which some directors interpret as being hungry for money, but he is not. He is just saying to Marzelline that she’s getting married and it’s nice to have a little money because it’s awfully hard if you don’t. You have to go hungry if you don’t have some money. This is the way I see him, but I’ve had to do him in different ways because of directors. I learn a lot as far as artistic and acting techniques go, and I get another dimension of the part, but basically if I am left alone, that’s the way I do him. He’s just a friendly guy and the audience will love him. There’s nothing complicated about him. BD: How has Lyric Opera of Chicago changed over 30 years? WW: I joined the ensemble here in1955, and I don’t think it has changed all that much. They’re doing a terrific job of getting the public in there. They sell a great percentage on subscription and the repertory is first-rate. They still get great artists, but in those early years we had the biggest names in the business at that time. We had Callas and Tebaldi and Bastianini and Bjoerling and all those people. That’s what Lyric was founded on. Today it’s leveled off a little bit. They still try to get the top names, but the way the company is run, from the administration, this is one of the top companies anywhere. Ardis is doing a superb job, and we always talk about how this is a wonderful company to work for. There is a good feeling connected with the company. They just couldn’t be nicer. They spoil you left and right. BD: Are the great voices of today comparable to those of 30 years ago? WW: That’s hard to say. I’d have to say no. There’s not been another Caruso, or in the Wagner department, another Melchior. 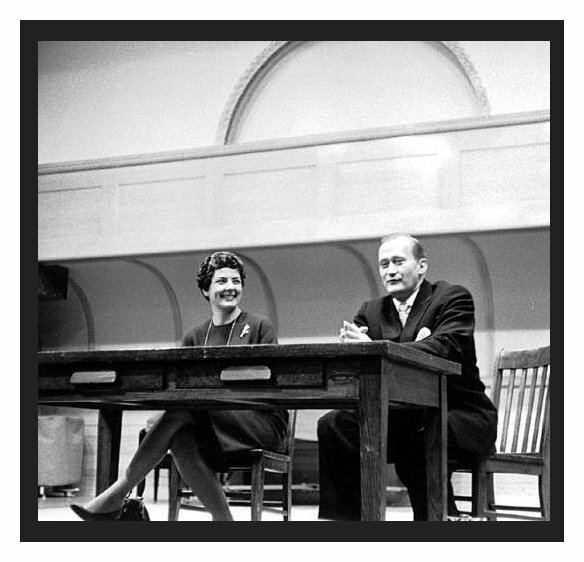 We have a couple of tenors today who have contributed to making opera more popular than ever, and it was Callas who started the whole thing of bringing dramatics to the stage. Callas started the whole trend, but now we have the Pavarottis and Domingos that are really bringing in the crowds. BD: Do we have “the Pavarottis and Domingos” or do we have Pavarotti and Domingo? WW: They’re almost doing it single-handedly. There are many others that should be recognized, but these two have the media in back of them to such a degree that even the guy on the street who’s never been to an opera is aware of these two names. BD: Should we have opera on the Johnny Carson show? BD: Will the supertitles mean the death of opera-in-English? WW: Yes, I think so. People just think that when an opera is done in their language that they will understand, but they won’t. Very few singers are really understood in English, with the upper ranges less than the lower ones and the women less than the men. But the audience will still miss a lot and it will be up to them to find out what it’s all about before they arrive. Not many people do that. BD: Do you work harder at your diction when it’s in English? WW: No. I’ve been told that I’m understood quite well in various languages, but that’s a method of my interpretation of my singing and my vocal technique. I really try to make the most of my texts rather than just making beautiful sounds. BD: Do you adjust your technique from house to house? WW: No, it stays the same. The way I sing is an ingrained technique, and no matter what the surroundings or circumstances it stays the same. There are some houses that are easier to sing in because the acoustics vary greatly. The European houses are a lot smaller than our big ones here, where you almost need amplification to come across. I know of European singers who have had great success and reputation there, who feel they have to change their technique to fill these huge auditoriums. Then within a few years, they are vocally finished. They hurt themselves doing that, and they really don’t need to. If you sing true to your own style and vocal technique, you’ll be alright. BD: Is this what you attribute your long and successful career to? WW: Maybe. Whenever I get a review now, I’m called the “veteran” singer or singing-actor. I’ve made my reputation as an all-around performer, not just vocally, but I think I have a knack for interpreting the part. One of the more charming interludes of last fall's New York City Opera season was its new production of ''The Merry Wives of Windsor,'' with William Wildermann prancing goutily and hilariously through the same Falstaffian part that he had taken 25 years earlier in the company's previous production of Otto Nicolai's light classic. Thursday night, the City Opera opened its spring season with ''The Merry Wives,'' and again it was Mr. Wildermann's show. The veteran baritone sometimes indicated more clearly by his facial expression or gestures where certain lower notes ought to have been, but his Falstaff left no one in doubt as to where the wit and sentiment in the part resided. Whether drinking lesser men under the table in a guzzling contest or making love to two merry wives simultaneously, Mr. Wildermann was a delight, plainly enjoying himself as the ludicrous old sot as much as he was being enjoyed. Mr. Wildermann was at his best, as before, while wearing the antlers and careering about the stage in the moonstruck final scene. His Falstaff, like many portly men, is a dainty dancer. There is arthritis in his step, but he overcomes it bravely. BD: Let me ask the indelicate question... when is your birthday? WW: Actually, I had one just last week, and it was number 67! BD: Is 67 a particularly mature age to still be singing professionally? WW: It doesn’t have to be. There are a few who make it, but not too many. BD: The styles of production have changed in recent years. Tell me about your reaction to this. WW: A lot has happened there. We are in an era today of the Stage Director, and have been for some time. WW: Too much so, yes. They just can get away with murder. If I were independently wealthy, I would turn down offers where the production was strange. It disturbs me greatly to have to compromise my own artistic feelings to satisfy the whims of these stage directors. Occasionally it works out well, though, as was the case when I was last here in Peter Sellers’ Mikado. Ordinarily I would have turned around and gone home as soon as I’d seen the thing, but it was so brilliantly done and there were so many things that worked well and that the audience loved. Sellars was so charming and persuasive that we would have done anything for him. It was a wonderful experience and I was happy to be associated with it. BD: So you would accept another engagement with him? WW: Yes. Maybe not opera... I have seen his treatment of Don Giovanni and I totally disagree with that concept. BD: Should there be a differentiation between opera and operetta? WW: Not really. It all comes out to the same thing. You use your voice, though it’s a bit light and frothy. There aren’t too many opera singers who can manage it – they’re too heavy and pedantic about their approach to it. But I enjoy doing them all. BD: In opera, where is the balance between art and entertainment? WW: Opera goes on its own. It’s the music first and foremost. The composer wrote the glorious music, and when you get to Wagner he also wrote his own text which is so profound and beautiful. When you have a performer who has the voice and understands what he is doing, you’ve got it made. But it doesn’t change from one thing to the other. You’re still yourself and you do the best you can. I’ve been lucky to be successful in both fields. BD: How much of your career is centered around Wagner? BD: Are there other composers how reach nearly that same level? WW: I’m very, very fond of and am glad to be able to sing parts by Richard Strauss, especially Rosenkavalier which I get to do on occasion and have done in Europe a lot. He would be my number two choice – and also Mozart. BD: Have you done all the Wagner bass parts? WW: The one thing in my career I truly regret is never having done Hans Sachs. It was in my plans and I worked at it, but when I coached it I just could not do it. I sang myself to death. It was too long and too hard. It’s a little more on the baritone side than my voice was, but you can almost get away with speaking the text of the beautiful philosophy. One of the greatest interpreters of the role that I knew was Paul Schoeffler, and we were going to work on it together but it never happened. Even after he had passed his vocal prime, his Hans Sachs put me in tears. Perhaps I could handle it now, but it’s too late. BD: Being a bass, did you opt for Pogner? WW: I did Pogner all along and still do it, but that’s not one of my favorite parts. He has a long and difficult monologue, but he must love to hear himself talk because it goes on and on and on, and you have to wind up with a good high F.
BD: If that’s not a favorite, which one is the preference? WW: Hagen. I do the Ring quite a bit and I think Hagen is my favorite part. BD: When you do a full Ring, should you do Fasolt and Hunding and Hagen, or is the last one enough for a cycle? WW: I have done them all, but there’s something more if you save the Hagen for the real wallop you can give it alone. It has more impact on the audience if they catch you just in the one terrific part. BD: How evil is Hagen? WW: He is black. He is completely evil. He’s a schemer, and he’s the most important thing in the opera. I’m a nice guy, but the challenge of being the bad guy is good for me. I get a lot of mileage out of playing that guy. BD: Where do you get the inspiration to play evil? WW: Just give me the text and I just interpret the words which are so brilliantly written. You don’t need any inspiration – provided you can do it. BD: Was there any satisfaction in singing it both in English and in German in Seattle? WW: No there wasn’t. It was a big imposition to do it one week in German and then the next week in English. It takes tremendous concentration to keep them apart. After all is said and done, the English audiences didn’t understand that much more of it. The papers used to say, “It was a great idea but we didn’t understand them anyway.” Maybe some singers were understood better than others, but it didn’t seem worth it. So they finally stopped it. BD: I was there in 1979 for the English cycle and I caught most of the words. WW: It was a pretty good translation, too. The Porter translation was not bad. [See my Interview with Andrew Porter.] But even so, when we were rehearsing there were words that we’d feel were just not right. This was not the right word, but try to come up with another one! I remember making one or two changes. George London directed, and we would rack our brains to come up with the right word. Maybe we would sleep on it and then it would come to us and we’d realize that was the right word! BD: Are there any redeeming qualities about Hagen? Is there anything on the positive side? WW: It’s all positive. If he’s that evil and that strong, even if he pulls all the strings and everything happens because of his scheming, to me that’s very redeeming. It’s a very satisfying part deep down. WW: Yes, a positive evil. Everything he says, even if it’s nice, has an ulterior motive behind it. BD: Is it a different kind of evil from Iago? WW: Yes. Well, evil is evil, I guess. I haven’t analyzed it that much. Iago is another big schemer. Basically one is Italian and the other is German. That’s about all I can say. BD: How does Hagen see the end of the Ring? WW: I don’t know whether he sees much of anything. He’s just obsessed with getting back the ring, and right at the very end he thinks he has it, and he doesn’t. He’s still scheming and makes one more attempt to get it away from the Rheinmaidens when they pull him into the water. I’m not sure he has much ambition except for the absolutely consuming desire to get the ring back. BD: What would he do with it if he got it? WW: It’s his birthright, his inheritance. Anyone who possesses the ring is absolutely invincible and all-powerful, even though, sooner or later that person is doomed. Everyone who has had it has perished, so you’d wonder why anyone would want it at all! BD: Perhaps he wants the transitory glory. WW: I guess so. I always felt that Wagner slipped a little bit with Hagen’s death. He’s so strong all the way through. He’s in evidence all the time, and when he tries to get the ring from the dead Siegfried and Brünnhilde interrupts him, he sort of slinks away and disappears before that one last little effort to get it again from the Rheinmaidens. He’s watching them and it’s over with just like that. I thought Hagen should have a more tragic death. They should put him on the pyre or burn him up or something. BD: You’ve sung both giants in Rheingold. How do you decide between them? 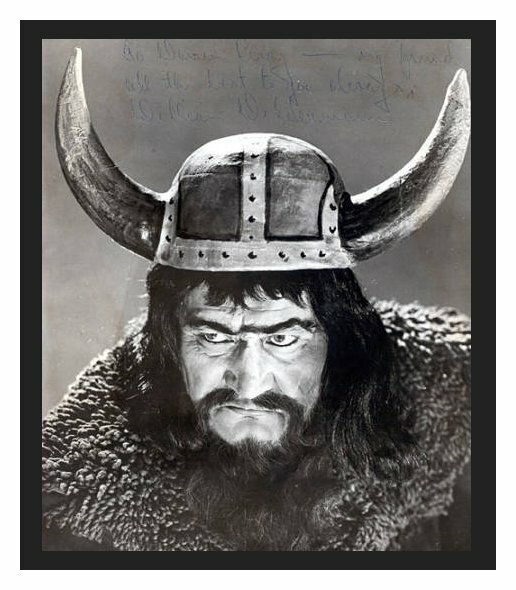 WW: I have sung both, but I prefer Fasolt. He has a little more to sing and I like his lines better. He’s the nicer of the two. He’s got some beautiful lines to sing and he’s more dominant in that opera. I started out with him, but I’ve also sung Fafner. BD: Did Fafner develop at all from Rheingold to Siegfried? WW: No, he just comes back as the dragon and sings half of his lines backstage to make the effect. There’s no development – on the contrary it’s kind of a letdown. His involvement in Siegfried is almost incidental. Sometimes the part is sung completely offstage, other times he comes back on in his old form as a giant after the dragon is slain. Wagner presents many problems in interpretation and staging. I actually covered the Hagen in Seattle last summer (1986) because it was a way-out new production that had never been done before. It was so new and different that if something had happened to the singer, there would have been no way to find a replacement. I attended all the rehearsals and was ready to go on. It was brilliantly done, but I don’t like it. 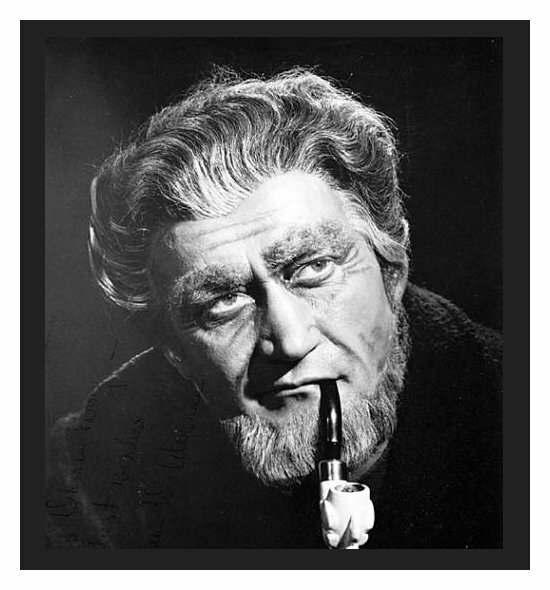 Give me the traditional Wagner – like Seattle did for years. I would have done it if necessary, though. A job is a job. Occasionally I wish I had the guts to be able to say no and turn down some of these things, but there’s only one colleague who can get away with that – Jon Vickers. BD: Is it not right that people experiment with the Ring sometimes and in some places? WW: I suppose it’s all to the good for the growth of art, but distortion just to satisfy the whim of a stage director is not enough. It doesn’t have to be new and different to be good. Leave it alone and you can’t improve on it. BD: You don’t want to use the old sets of Adolph Appia, do you? WW: No, use new sets, but what I want to get into a Ring somewhere would be all the latest technical advances with lighting and sound effects and echo chambers – the Walt Disney kind of approach. Let them do one of those, but keep it straight. I did a Walküre in Dusseldorf with a lot of projections. I don’t know why they don’t do more of that elsewhere. BD: Have you done any directing? WW: [With a sigh] Oh, one time in Edmonton, Canada. The director for the Flying Dutchman cancelled, and I was in the cast and told them I knew the work completely. They knew I wasn’t a director, but I could put it together and they were delighted. That was my first attempt and some things worked quite well, but I quickly realized the difficulties a director has of making himself understood. The chorus, for instance, when they were learning it were not taught the details word for word. I’m kind of a spontaneous actor, so it’s not rehearsed but rather it comes from within. It’s improvised. But being the director I had to tell them every move. “Now here you go three steps to the left, and when you see him come down here, then you come across the top...” and this takes time. My lighting was excellent because I knew what I wanted, and we had a good lighting man who was able to get what I asked for. BD: Does that encourage you to do more directing? WW: At the moment I was rather discouraged and thought no, that’s not for me. I may change my mind. I’ve had many offers to continue my career either directing or teaching, and I’m sure I could contribute a lot but I don’t have any real desire for it. I own a wonderful piece of real estate that I live on, about 150 acres in the Catskill mountains of New York State, and my dream all my life has been to retire there and raise a few chickens. I don’t see myself continuing in this business. I would rather get away from it. WW: He’s one of my favorite parts. BD: Does having been a longshoreman make you feel a little warmer toward Daland? BD: Is Daland a nice guy? WW: He’s a really nice guy, just like Rocco in Fidelio is a nice guy. He’s not a money-grabbing schemer like they make him out be sometimes. Daland is a salty, down-to-earth character who has a chance to get rid of his daughter. He has probably wanted to get rid of her for a long time because she’s been around home much too long, and she’s a bit cuckoo with her hallucinations of the Dutchman. So when he’s offered all these riches on top of that, he says OK! He succumbs to the temptation, but basically he’s a nice guy. BD: So he thinks this would be a good marriage for his daughter. WW: Sure, even though he’s a little perplexed at the strangeness of the Dutchman. He doesn’t understand it and he’s a little overwhelmed by the offer of the chest of jewels. I play him as a seaman who loves his daughter. BD: Is it safe to assume that Daland would not have given his daughter to someone who was truly nuts despite the offer of the jewels? WW: I think he would have given her anyway. [Both laugh] It was an offer he couldn’t refuse. He was happy to marry her off to anyone who made any kind of advances toward her. BD: Should that opera be done in one piece or three? WW: It’s too long to be done in one piece. It’s a noble experiment, but audiences like to have a little pause. One intermission is fine and a lot of operas are set up that way. I did the crazy production at the Met by Ponnelle where the whole opera is the steersman’s dream. Bayreuth has done it with Senta envisioning the whole thing. I want some guy to make it Daland’s fantasy! These are novelties that some people may enjoy and find them interesting, but they don’t stick around. In show business there’s only one thing worse than being talked about and that’s not being talked about. That’s why they do these things. BD: Is opera show business??? WW: Sure! It should be. It’s entertainment. It shouldn’t be too deep. BD: Are the Wagner operas too long? WW: Yes. I’ve always felt that there should be two scores published – one for everyday consumption, and the other with every note to be used only in Bayreuth. There they can do it and it should be done with every note, but elsewhere there should be cuts. Wagner would then be as popular as Verdi or Puccini. It would be on the menu all the time if it weren’t so long. I’ve done productions with cuts and it’s worked very well. Some cuts are substantial and it’s much the better for it. We did Meistersinger in Cincinnati a couple years ago and there just wasn’t enough time to rehearse it properly. So the conductor made some big cuts, including one in my monologue as Pogner, and I was delighted! BD: What do you as a singer expect of the audience that comes to the opera? WW: I wish they would do a bit of their homework. In this Katia here, the opening night audience didn’t seem to be with it. The second night was much better and it’s been up and down. They’d gain tremendously from reading the libretto or the program notes, but this opera is not everybody’s cup of tea. It’s hard music. The people who come to opening nights or the society nights may not be quite as knowledgeable, but I don’t know where they fall in terms of which days of the week. I’ve sung in Argentina a lot and their opening nights are very proper and dressy, but the performances for the man-on-the-street and students are at greatly reduced prices, and those audiences are the opera-lovers. BD: Are the acoustics at the Teatro Colón as good as they say? WW: Yes, I would have to agree that they are. BD: When you are preparing these roles, how much digging do you do? Do you go back to letters and diaries, etc.? WW: I have to shamefully admit I don’t. I just go to the score and I look at the text and interpret the text the best I can. I have my own ideas about the character, the way he should be played as I read the score and work on it. You get ideas as you learn it, but I don’t go through the details that I understand some singers do... going to libraries and researching it all. I suppose it depends on how big the part is and how important it is. BD: Moving on to Tannhäuser, tell me about the Landgrave. WW: It’s a good part. It’s a perfect part. He’s a benevolent, wonderful guy to Elisabeth, and at the minnesingers contest he officiates and compliments the singers. He only gets vehement one time when he condemns Tannhäuser for his outbursts. But he’s a nice guy and he looks so good! The last time I did it at the Met, a couple years ago, my wig and makeup all looked fabulous. I did it with Rysanek and it was wonderful. Of the other principals, William Wildermann stood out, as he so frequently does, for the intelligence of his portrayal. He did not merely put on the robes of the Hermann - he became that good-hearted Thuringian landgrave. He is that rarity, a singer who acts with his voice and his whole person. BD: When you’re onstage, do you become the character or are you portraying the character? WW: I would almost say that I become it. I get into it and really feel that I am the character. I really get very involved with whatever I do. The intensity comes naturally, and I have built a reputation over the years that I am a good performer. BD: Then how long after the end of the performance does it take to throw that off and become William Wildermann again? WW: To unwind and let it simmer back down again after the performance takes a while. It will be a couple hours before I can go to sleep. BD: Continuing with your Wagner characters, what about Henry in Lohengrin? WW: That one I don’t like. He has a lot of ensemble singing and not too much solo work. It doesn’t give me anything. He’s a character I’ve never been able to identify with. Not every one suits you. Another one I don’t like is Marke in Tristan. He goes on and on, and to me he’s unsympathetic. I can’t get anything out of him. Nine times out of ten, unless there was a tremendous amount of money involved, I would say I don’t want to do it. In the Italian repertoire, another one I could never get behind was Alvise in Gioconda, and in Lucia I always felt that Raimondo was just there to make a sextet! He needed a bass. I’ve done Gurnemanz once or twice in Europe, and it’s another of those parts I am not particularly fond of. It’s a very beautiful part, but it’s so very long. It would benefit from a little editing here and there... In that opera at the Met I often did Titurel. BD: Is there anything to that part, or do you just sing it? WW: You just sing it. You’re backstage so it’s the voice that comes through. You try to be as ex-press-ive as you know how, and to sing it as well as you know how. BD: Should he come onstage? Here in Chicago a few weeks ago he appeared onstage. WW: I’ve never seen him be onstage. He is just a voice and is very persuasive that way. BD: Would you object to coming onstage? WW: I only know it this way, and it feels right. I’d have to really get used to that. BD: Besides Hagen, which other roles do you like to do? WW: Ochs in Rosenkavalier is a great part. I know the language inside out and can even do the Viennese dialect that is required! BD: Tell me about Baron Ochs. What kind of a clown is he? WW: He’s a clown and yet he mustn’t be played as a clown. When he gets his comeuppance at the end you have to shed a tear for him. You have to feel sorry for this oafish boor. He is a guy who doesn’t really know what it’s all about. He can’t help it, and if you play him as just a clown you’re missing the essence of the part. He’s a marvelous personality that you have to make sympathetic. It’s a long part, and you need to keep doing it. If I were offered it today, I would have to say I need more time to prepare it. Musically it’s very difficult and it’s very long. There are some roles that even if I haven’t sung them in years I could do tomorrow, but not Ochs. DER ROSENKAVALIER By Richard Strauss. Opera Company of Boston, Conducted by William Fred Scott; Staged by Lisi Oliver; Scenery by Herbert Senn and Helen Pond. The Opera House, Washington St., Boston, April 13 at 8 pm; April 16 & 23 at 3 pm. Rush tickets may be available for $15 with student ID from 2 pm on April 23. "HOW COME OCHS gets such wonderful music?" I asked Opera Company of Boston Artistic Director Sarah Caldwell, who was for once enjoying the opera from a seat in the house, rather than conducting the proceedings in the pit and on the stage. "It's all he gets," replied Caldwell of the ungainly lecher, whose advances only lead to ever more humiliating embarrassments and failure in Richard Strauss's Der Rosenkavalier. But Strauss's music is no booby prize, especially when played by the Opera Company orchestra. BD: In other comic roles, how do you make sure it doesn’t become slapstick? WW: It’s instinct. Don’t sentimentalize a sentimental song I heard somebody say. You have to know how far you can go and not make it slapstick. Maybe sometimes it calls for slapstick. 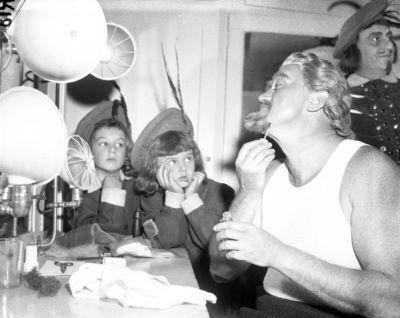 I have done Broadway shows, and I remember that some of the cast members were successful and would get laughs and responses from the audience, so every succeeding performance they would overdo it a little more until the director – who might not have been around for awhile – comes back and tightens it up a little bit. He would say that the person was getting carried away with it and was no longer funny. You need someone who keeps a rein on you and an eye on you, and a good director will do that. BD: What is the ideal number of performances in a run? Five or six, or twenty or thirty? WW: I don’t really care. If we’re getting paid by the performance, the more the merrier! In opera, I think five or six or ten is the ideal. A Broadway show might run for months, and that could be pretty hard to take. BD: What’s the biggest difference between singing at the Met and singing on Broadway? WW: Basically there is no difference except that you are closer to the audience in a Broadway show. There seems to be a lot more distance in the opera, whereas Broadway is much more intimate. Broadway also is not just music and singing, but also has a lot of dialogue, which is a whole new set of demands on a performer. BD: Is that similar to Fidelio or The Magic Flute, going from singing to the spoken dialogue? WW: Yes, it’s very much the same. But on Broadway, when you get into your lines you try to make them not sound as if the music has stopped and now you’re talking. You let it flow like one goes into the other, whereas in opera that is not so. You finish your singing and you say your lines. That’s perfectly fine. You don’t have to do more than that. BD: Does that present any vocal problems? WW: No, I don’t think so. BD: Tell me about the recordings you have made. WW: I have a few. There is a Beethoven Ninth with none other than Bruno Walter! There is also a St. Matthew Passion with Bernstein. There are no solo discs, but I remember making La Juive because there was no recording in existence back then. Some promoter decided to do it. 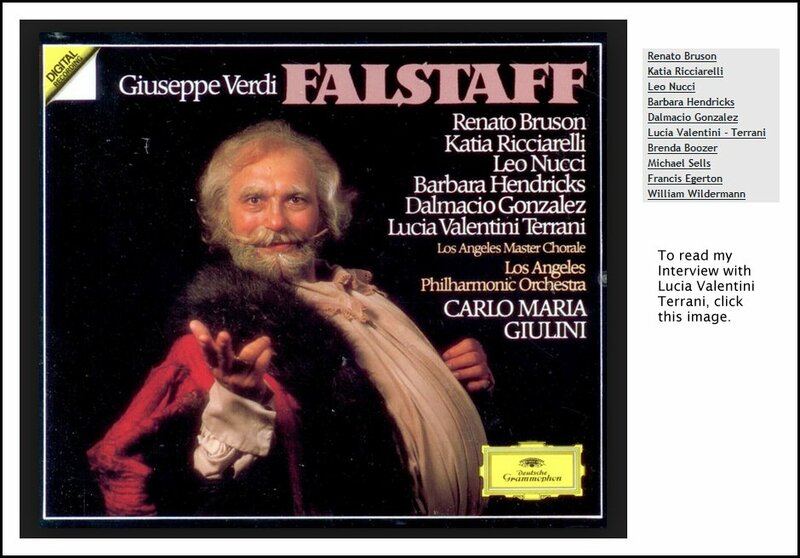 The most recent recording is the Falstaff with Giulini where I sang Pistol. Notoriously "the worst opera recording ever made", this heavily cut performance of LA JUIVE is probably not in fact that, but suffers from two tenors very much past their prime, Miklos Gafni as Eleazar, and Nico Feldman as Prince Leopold. The two ladies, Francis Yeend as Rachel and Alberta Hopkins as Princess Eudoxie are just fine, and bass William Wilderman is really superb as Cardinal Brogni. (...) MET bass William Wilderman is the real star here, unfurling waves of beautiful Bass sound. To economize, the orchestra, under Erasmo Ghiglia, was recorded in Florence, Italy while soloists and chorus were recorded in New York City. This was simply not a realizable technical feat in 1960. The joins and splices are audible and clunky. 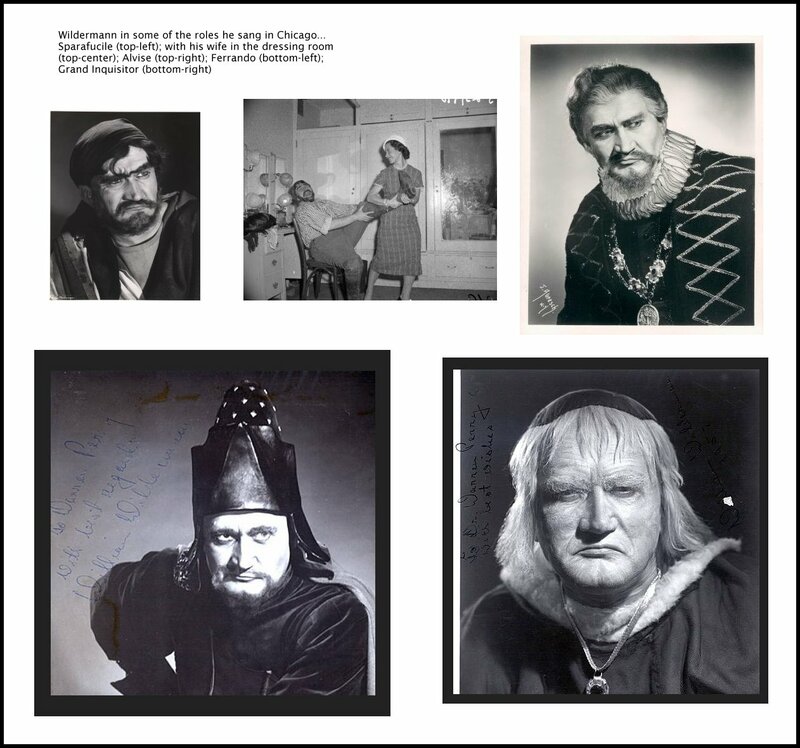 The set comes with a nicely designed booklet with background information, bios and performer photos, as well as a copy of an old Rullmann libretto that doesn't always match the work as performed. BD: Is it gratifying to make recordings, or is it artificial? WW: Oh, it’s artificial. Sometimes recordings are made during performances and you are not even aware of it, and other times there are special sessions. I don’t have any particular feelings about them. It’s just another job or another performance and another check, that’s all. [Both laugh] Speaking of checks, I still get them occasionally because of the video of the Ballo in Maschera I did with Pavarotti at the Met. Because of him it sells all over the world, and when it sells, they have to pay everybody connected with it. BD: You were Sam or Tom? BD: Are recordings a good thing? The public has become so enamored of them. WW: They are a fabulous thing, and I envy anybody who is really in the recording market. That is one of the ways to build up a career. I’ve always wished I could do more of it but I’ve never been asked. Over a long period where they use everything you do, I think it’s a great thing. On the other hand, many singers who are under contract with recording companies are feuding and fighting with these people all the time. Either they don’t want things to be released because they don’t like what is on there, or they feel they’re not getting the proper money from them. Despite what they are told about sales numbers, there are a number of singers I know who feel they are being misled by the recording companies and are not getting what they are supposed to be getting. BD: Tell me about the Beethoven Ninth. Is this a good thing for you to sing? WW: I enjoyed it at the time. Let me tell you a cute little story about it. I was kind of a beginner when that all happened. They approached me and said that Maestro Walter would like me for this recording, and I had to tell the agent that I had never sung it before. They were amazed and said they didn’t believe it. They said they would have to speak to Walter, and the word came back that he would teach it to me. Can you imagine? Two days later when I had the first appointment with him I had learned the thing, but I went to his apartment at the Waldorf Astoria and he taught it to me with great patience and with great love and with great affection. He was one of the truly great people. I have sung it a few times since, and also the Verdi Requiem that the bass gets to do. BD: Is it interesting to sing in concert where you don’t have the makeup and all the stage trappings? WW: It’s much harder. I find concerts frightfully difficult in a way because you are kind of naked standing up there. You’re just selling yourself, where in opera you can hide behind the scenery and the makeup and everything else. It’s much easier for me. BD: What about contemporary opera. Have you sung some world premieres? WW: I have, and I have now arrived at the stage of my career or life where I will not do anymore. I have nothing against them, but I wonder what they have against me! All that work and most of them never have a repeat performance. BD: Do the contemporary composers not understand the voice? WW: Some of them do, a little bit. Most of them probably don’t. One or two have been fairly successful. Menotti seems to understand voices, but generally they seem to have to do something different from what anybody else has done. BD: You wouldn’t want a new composer to write another Bellini opera, would you? WW: No, but there are some performers who are cracker jack musicians who are trained and can sight-read this stuff. I have to admit that I have never been that well prepared. To me it’s hard to have to have somebody bang it out for me at the piano. It takes a longer time for me. I always tell people I am not a musician, but I’m musical. I’m very musical and can learn the hardest things, but it’s an effort. It takes a long time and then you ask why. I am constantly being offered these kinds of parts and was very successful at it, but it’s not worth the effort for me. WW: I wonder sometimes where we’re going. There is more opera today than there ever has been before, and yet I wonder if it can stay, if it will perpetuate itself the way it is. I don’t know. You sometimes hear suggestions that with our electronic age that we’re in they might have actors or performers onstage and somehow have the voices dubbed in. You’d have the best sound with good people acting it out like they do in the movies quite often. An operatic movie will have the voices dubbed in with first-rate actors. Maybe we’ll get into that, but at the moment it’s pretty healthy. BD: Do you think that opera works well on television? WW: Yes, it works well on television. They’re not all the same and some are better than others, but I have seen some great television productions of opera. BD: Is this expanding the audience? WW: Yes, it also helps to develop an audience, to expand the audience. WW: To me it is, and the minute it isn’t fun any more I’ll quit. I can still do it, I can still produce, I can still contribute something, and it’s still enjoyable. As I get older, what I don’t enjoy so much is the travel and the loneliness and the different cities and living in hotels out of a suitcase. And the flying; that is the worst. Airports today are the pits. BD: Despite that, let me be selfish and hope you will you be back in Chicago again. WW: I don’t know right now. Maestro Bartoletti came up to me the other day and said my voice was in remarkable shape for someone my age, and asked me what parts I was still singing. So maybe he was pondering upcoming seasons... When I started here, back in 1955, I sang for maybe ten years and did everything. I was here practically every season in practically every opera. Then I kind of drifted away and went to the Met and Europe. I was in Germany for ten years. It took me many years, but I found my way back here again. I’m cutting down a little bit these days. I was offered something the other day and I turned it down. I didn’t even look at it or know who wrote it. I just said no. I’m now looking forward to going home to my Catskill Mountain retreat. I’ve been on the road for at least three months. I was up in Canada with a Mikado before coming here. BD: Thank you for giving us so much all these years. I wish you lots of continued success. WW: Well, thank you, Bruce. This interview was recorded at his apartment in Chicago on December 11, 1986. Portions (along with recordings) were used on WNIB twice in 1989, and again in 1994 and 1999. The transcription was made and published in Wagner News in December, 1989. It was re-edited and posted on this website in 2013.